This recording was made at the I’PARK e-Sports Stadium at Yongsan station in Seoul. It documents one ‘set’ in a professional StarCraft II: Wings of Liberty match, a real-time strategy game developed by Blizzard Entertainment, as part of the 2012-2013 season of the SK Planet Proleague, the premier professionalStarCraft league in South Korea. 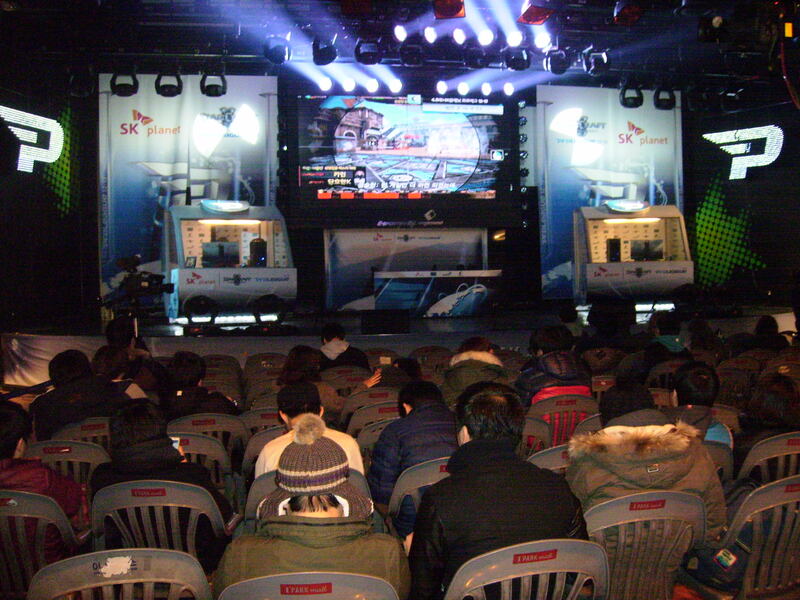 Since 1999, e-sports (particularly StarCraft) have been contested competitively in South Korea. Although there are some twenty-five different professional ‘e-sports’ (a term that encompasses video and computer games that are the basis of competitions) in Korea, StarCraft is the most well-established of the bunch, has the most history, and arguably has the largest global fan following. The Proleague is organized under the auspices of the Korean e-Sports Players’ Association (KeSPA) and is comprised of eight teams, each with about twelve top-tier players. Each team is sponsored by a company/companies and houses its team members in a ‘team house’ somewhere in Seoul (the locations of these houses are kept secret for the privacy and security of the players). Professional gamers can make upwards of $100,000 per year in salary and prize money. They spend between ten and fourteen hours each day solely practicing StarCraft. Right now, the only players in the Proleague are male, although there have been female players in the past and are currently some female professionals in another Korean StarCraft league. The players range in age from their mid-teens to mid-twenties, typically. The Yongsan stadium is located on the top floor of a well-known electronics market and mall. The ‘stadium’ is more like a large theater, with a raised stage at the front, floor seating for 120 fans, and team ‘benches’ at either side of the floor. Matches are held every Saturday and Sunday and are broadcast live on OnGameNet, a Korean cable television channel devoted solely to e-sports and gaming-related programming. Matches are free to attend and attract casual and ‘hard-core’ fans, as well as the legions of ‘fan girls’ (sonyeo paen in Korean) who make up the official fan clubs for each team. Two ‘casters’ and a commentator provide running commentary of each match, analyzing the participants’ strategies and reacting with energized shouts and cheers whenever a player pulls off a remarkably good move or, alternatively, makes an inauspicious mistake. The players face off one at a time in 1 vs. 1 sets, and the team that can win a best four out of seven wins the match. When playing, the designated players take their stations inside of a soundproof booths and are monitored by KeSPA referees who make sure that they don’t break the rules of fair play. A typical set last between eight and twenty minutes. This entry was posted in South Korea, Uncategorized and tagged computer games, e-sports, information culture, South Korea. Bookmark the permalink. Feliz Navidad from San Miguel de Allende!